An inventive combination of a capella and accompanied songs, combining superb harmony with sensitive guitar/cittern arrangements. Nick and Ed perform mostly traditional songs plus a range of more modern material written in a traditional style interspersed with some contemporary offerings. ("Prototype" - Caffrey/McGurk (EP - 2011). "Long Looked For Come At Last" - Nick Caffrey. North West England but will travel anywhere. 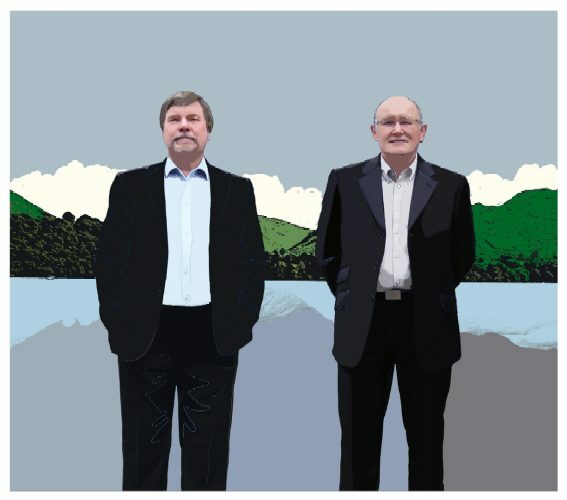 Caffrey/McGurk continue to delight audiences in folk clubs, concerts and festivals. Their enthusiasm for singing remains as fresh and original as it was when they first performed together in Litany 35 years ago. Their obvious enjoyment of what they do is carried to audiences creating a warmth that makes it a pleasure to be in the company of this popular duo. Nick Caffrey is considered one of the finest unaccompanied singers in the North West of England. He has extensive knowledge of traditional songs and ballads which enables him to give talks and run workshops on traditional ballads and folk song. He has previously been a member of Litany, The Wassailers and Th'Antique Roadshow bringing his fine vocals, knowledge and humour to Caffrey/McGurk. Ed McGurk has been a driving force in the Lancashire folk scene for many years. From his early days as organiser and member of resident bands Nevis and Litany at Clitheroe Folk Club, he went on to join the enduring and still successful ceilidh band, The Riot Band, he is a highly regarded solo performer and is a founding member of the popular folk group Bandersnatch. "Together they performed a fine selection of songs beautifully underpinned by Ed's understated acoustic guitar. This duo has an album out alongside their respective solo CD's and are becoming a real force to be reckoned with." "One of the best guest appearances that I have seen at the Nursery."